There are a couple of ways to change the font style on Android but the method you use will depend on what brand of phone or tablet you have. If you have a Samsung or LG device, many models from these brands come with a selection of fonts and an option in Settings to change font style. If you have a different brand of phone or tablet, such as Google, Huawei, Xiaomi, LG, or others, you can still change your font style with a little help from a launcher app. Samsung has the most robust font options pre-installed. Samsung has a built-in app called FlipFont that comes pre-loaded with a number of font options. To change your font on most Samsung models, you go to Settings > Display > Font Style and select the font you would like to use. On newer models, such as the Galaxy S8, the font options are found in a slightly different place. On those newer models, the most common way to change your font is Settings > Display > Screen zoom and fonts > Font Style and select the font you like and tap Apply. Additional font styles are also available for download from Google Play. The extra font styles released by Monotype for download, the company behind the FlipFont app, generally have a fee per font. There are also a number of free font set downloads designed by independent developers for use with the FlipFont app listed on Google Play 404, however, many of these no longer work after changes Samsung implemented on most of their models along with the Android Marshmallow version update. The most commonly cited reason for this block of third-party font packs is a copyright issue. Samsung Galaxy devices can also download fonts from Samsung's Galaxy Apps Store. Then scroll down to Font type to choose from the available fonts. When you find one you want to use, tap it to activate that font. Go to Settings then tap Security. A warning window pops-up to let you know this option may leave your device vulnerable. Click OK and close out of settings. After you have downloaded the app and any fonts you’d like, you can change that security setting back by following the same path and just unchecking the Unknown sources box. For most other brands of Android phones that are not Samsung or LG, the simplest and the safest way to change font styles is by using a launcher app. While there is one other way, it is much more complex and requires altering files in the directory of the operating system. It also requires you to download an app that will "root" your device, or give you access to protected operating system files. In most cases, rooting your phone or tablet will void the warranty on the device and may cause other issues with the way the device performs. The main difference when using a launcher app compared to a pre-loaded font feature, such as the LG and Samsung font features, is that the labels and main menus will have the new font you’ve selected, but it typically will not work within a different app, such as a text messaging app. And not all launcher apps give you the option to change just the font style. Some require downloading theme packs to work with the launcher to access fonts and you may have to apply the entire theme to make the change. We'll cover two available apps that allow font changes without having to apply an entire theme. Keep in mind that some apps work differently depending on the brand of phone or tablet you have and app developers make updates from time to time that may change or limit features. Launcher apps need to take over as your default home screen to display your font changes consistently. 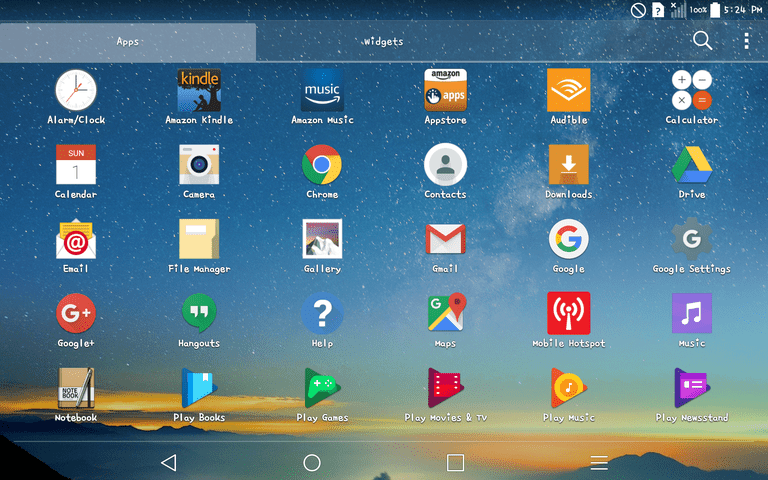 When you first open a launcher app, your phone or tablet should prompt you to select whether to use it for your home screen Just Once or Always. Select Always for the launcher to work properly. You can also change this by going to Settings > Device > Home and then selecting the launcher app you’re using. Apex Launcher is available in Google Play. Once you have downloaded and installed the Apex Launcher app, it should automatically add two icons to your home screen: Apex Menu and Apex Settings. From that menu select Icon Settings and then Icon Font. The Icon Font screen shows a list of available fonts. Select the font you like and it will automatically update the icon labels on your phone. Unfortunately, this won't change the font within other apps but it does give your home screen and app menu a fresh look. For an example using Apex Launcher, choose a new font from the list and see how it looks. Select Dancing Script as the new font and then open the app menu to see it applied. The GO Launcher Z can also help you change your font style, but the same limitations apply as with other launcher apps. If you are familiar with launcher apps, you may have heard of GO Launcher EX, which is the previous version of GO Launcher. There are still some supported themes and language packs for the EX version in Google Play. Click the icon with the wrench called GO Settings, which will open the Preferences menu. Once in the Preferences menu, tap Font. Then choose Select Font. This will pop-up a window of available fonts. Before you select a font, first tap on Scan Font in the lower right corner of the fonts window. The app will then scan for any font packages already on your phone as part of system files, or even other apps. For example, on our Droid Turbo, it found a few interesting fonts in another app we have called INKredible. Once the app is finished scanning your phone and other apps for fonts, you can scroll through and select the font you like by tapping the circle next to it. The new font is automatically applied to the labels and icons in your phone. You will likely see several duplicates in the font list from different apps as many apps use the same set of standard fonts. For an example using GO Launcher Z, choose a new font from the list and see how it looks. We've selected Luminari as our new font and open. The image shows how it looks in the app manager menu. The only issue encountered in our testing of GO Launcher Z was a black dock bar along the bottom of the home screen and app menu screens that blocked a portion of the screen and did not go away even after selecting to hide the dock in the app settings. The most common reason for this persistent black dock bar is that the app developers have missed an update or have not yet updated the programming to the most current Google specifications/Android release version. The launcher app fails to recognize an existing button or icon for the app menu screen and inserts one. This is most common after updates to the Android operating system are released to the public, but the issue is typically resolved through a bug fix in a future app update.